Vivek Dahiya rides a Hayabusa for a stunt in Qayamat Ki Raat! Mumbai, August 06, 2018 (Team Online News India): StarPlus’ show, Qayamat Ki Raat, has been gaining popularity ever since it went on air. The show’s protagonist, Vivek Dahiya, has gave his blood and sweat into making this show a huge success along with his co-stars. While shooting for a sequence in Qayamat Ki Raat, the actor had his own ‘Dhoom’ moment where he rode a ‘Hayabusa’! 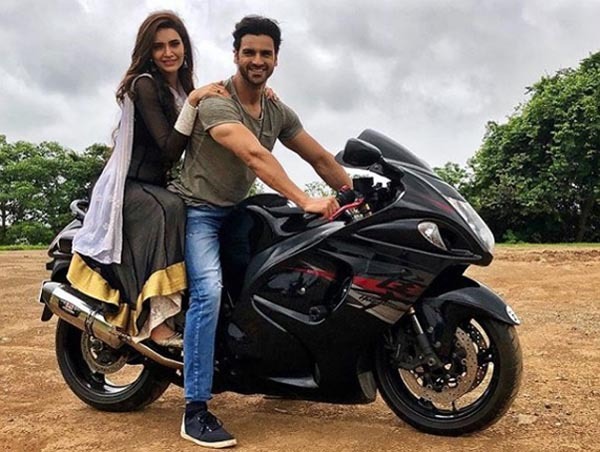 Just like John Abraham in Dhoom, Vivek Dahiya was rocking the Hayabusa like a complete stud and even gave Karishma Tanna a ride down the filmcity road on his bike. Vivek entered like the hero he is in his hayabusa which was later used for a stunt he performed on screen for Qayamat Ki Raat. The actor indeed let his inner boy out and performed the sequence on the Hyabusa, and then performed anther stunt by hanging from a cliff! The actor is quiet the daredevil, but sure did have a gala time riding the ultimate sports bike.